Blanket Weed is the curse of keeping a pool. If I could invent something to eliminate blanket weed without causing any other problems I would be a millionaire overnight! • Excessive sunlight Reduce direct sunlight by using more large leaf plants i.e. Lilies or surface cover plants. (see plant notes below) Using greenhouse netting either loose or on a frame can be used on bright days and removed when not needed. • Fresh water Reduce the amount of fresh water being added to the pool. If you need to top up the pool too often Why? Is it because of a leak in the pool or waterfall etc. if so let me know so I can try to fix it. Try to use rain water, providing the water is clean and the ph is low, or water left to stand for a couple of days using rain barrels or tanks attached to your gutter down spouts etc. These are normally fairly easy to install, if you need any help or advice just let me know. • Fertilisers The worst one is lawn feeds. If you need to use these try not to use them within a least 6 feet (2 meters) of the pool, this applies to any type of fertiliser as well as the use of pesticides etc. The best feed for the garden is rain water or pool water. 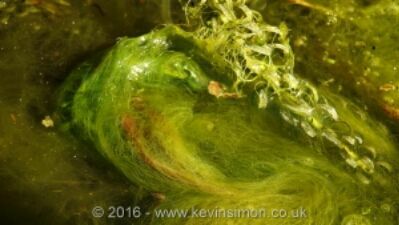 Remember if you have Blanket Weed growing out from the sides of the pool then stop feeding the fish as they can and will eat the Blanket Weed, its Natures Natural Fish Food. Fish Waste Now the fish produces this when they are eating and too much waste is not only harmful to the fish but is a good source of nutrients for Blanket Weed. The way to control the excess waste is to have adequate filtration and ensure the pool is kept free of too much debris. Remove dead leaves etc. update your pool filtration to remove concentration of sludge etc. This will not only keep your pool fresher and clean but will also help to keep it clear. Plants Have adequate plants in the pool that not only cover the pool surface but will help in fighting for any nutrients available thus starving the Blanket Weed. Now no matter how much you try sometimes you can never seem to get rid of the Blanket Weed, now some in a pool is normal, in fact if you do not have any Blanket Weed I always say get worried as Blanket Weed only grows in GOOD water so if none is present then the possibility is that your water is not as it should be. There can be numerous reasons why your water quality is not up to standard the main one being too much rotting debris in the pool or filter, which is why it is important to have the pool and filters serviced regularly. Poor water quality is not only harmful to the plants but can sometimes be fatal to the fish and other aquatic life, so by observation of the pool and its condition most problems can be sorted before they get too bad and you start to loose fish etc. There are a lot of chemical treatments for Blanket Weed, though in my experience these are a temporary fix as they only work for a few weeks then you are back to square one. If you do use any chemical treatment make sure to read the label and instructions carefully as too much can have a detrimental effect on fish and other plants in your pond.